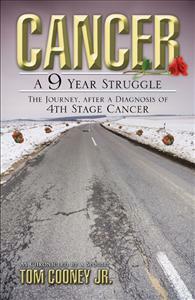 Travel with Tom and Irene through 9 years of cancer. Accompany them through 6 major surgeries, 175 chemotherapies and several clinical trials then witness Irene’s final moments. Tom and Irene created the best road to travel through 9 years of 4th stage cancer treatments including 6 major surgeries, an extraordinary 175 chemotherapies, clinical trials and many other procedures. With probable life expectancy at 2-3 years initially, Irene chose to undergo aggressive regimens providing optimal outcomes even though side effects would be worse than common protocols. Between treatments, they traveled extensively always urging the medical team to focus on quantity. Tom and Irene, themselves, would concentrate on providing quality. Tom Cooney Jr. takes you along with him as Irene braves the rugged path before her. "I just read the book Tom. It is absolutely WONDERFUL! I sent you a personal message on your personal page because that was the first page I discovered. By the way, this is from Chrissie...the funeral home secretary. This book is truly the most beautiful true love story that I have ever read. Your writing style is perfect and the parts taken from Irene's journal entries make it very personal and heartfelt. I shed tears and I laughed too! Thank you again for sharing "your" Irene with all of us! A MUST-READ for caregivers, survivors, or anyone who wants to experience the sweetness of TRUE LOVE."